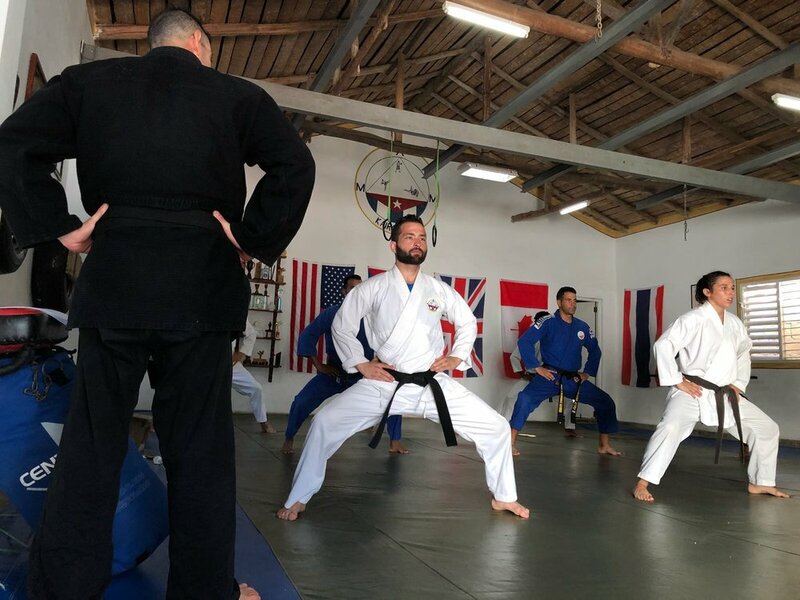 Arroyo Martial Arts Academy Tampa is part of Arroyo Martial Arts Clubs which have locations in United Kingdom, Canda, and its main one in Cuba and it is run by Sensei Randy. It was founded by Master Julio Cesar Castro Carmenate who is a black belt 6th dan in Shotokan Ryu and Kairon Ryu. He also has a black belt 3rd dan in Japanese Jiujitsu and is Kru in Muay Thai with certificates in sports science, personal training, gym instruction and licensed as Zumba instructor and massage therapy. The local dojo is located at 13970 West Hillsborough Ave. Tampa, FL 33635. It is headed by Sensei Randy Echemendia, champion in Karate Do, and Kickboxing in Cuba and Wales, UK respectively. He has a black belt in Shotokan, Jyoshinmon Karate Do and Kairon Ryu; and trained in Moron, Cuba, and Liverpool, England. After spending some time to train in Cuba and the UK, he is now bringing the Kairon Ryu discipline to Tampa Bay. Arroyo Martial Arts Academy & Fitness Club is a multidisciplinary gym that recently opened in Tampa. It offers elite training by world class senseis trained in different forms of self defense and martial arts. The main focus of this dojo is to teach Kairon Ryu, a new form of mixed martial arts which combines Japanese jiu jitsu, Karate-do, muay thai, and tai chi relaxation techniques. Other fitness classes offered are Circuit Training or HIIT, Zumba, and more. Kairon Ryu, an alternative form of martial art is the brainchild of Master Julio Cesar Castro Carmenate, a native of Moron, Cuba, who, at a very young age, started training in different forms of self defense disciplines, and has since then brought together the best techniques, thus giving birth to Kairon Ryu. Martial arts teaching basic principles of Kairon Ryu, concentrating on discipline, balance, and technique. New starters can wear any workout type loose clothing but most people prefer to wear Martial Arts uniforms which are more comfortable and suited for the exercise. As with all classes on the mats no shoes are allowed. MMA style class catered to adults who want to learn martial arts and self defense. This class is targeted for precision, stability, and mastery of the discipline. Interval training circuits to condition muscles and burn fat fast. This class increases endurance and strength. Wear appropriate workout clothing and bring a towel. Reserve a slot for you or a family member by filling up the form below. Tell us about yourself so we know how to best cater to your needs. This is a slot reservation. Please come in 15 minutes before the class to complete registration. What time can we best reach you?